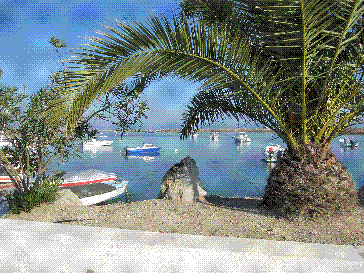 This page is general information on east-west-algarve. So you have some idea of what to expect if this is your first visit to the Algarve region.Weather.The Algarve generally has one of the best climates in the world.If you want to bathe in the sun then the Algarve in june,july and august will more than satisfy you but is a little gentler than many tourist hotspots because of its position on the Atlantic coastline.Some sea breezes make it a little more tolerable in the heat of high summer.Rain is unusual in the summer but of course as with anywhere in the world it is possible.east-west-algarveThe rest of the year is more gentle and a little more changeable although warm sunshine is always possible even in december and january.Overall you will have a better chance of sunshine in the Algarve than many of the worlds hotspots.Rain can be torrential and spectacular but is not normally as depressing as say in the UK.This is because light levels are much higher and why this area is known as the"Coast of light".It is rare to rain all day and the sun can burst out very suddenly. There are three main regions in the Algarve;the east being the nearest to Spain and the Mediteranean possibly has the best weather overall and is not so blatantly touristic.east-west-algarveThen we have Central Algarve which is the area built up for tourism and where you will find the most nightlife and the biggest crowds,especially the young.The west is most exposed to the Atlantic and therefore tends to have more breezes and so often feels cooler.It is more Touristic than the eastern region but not as much as the central region.This is where you will find most of the watersport enthusiasts. east-west-algarveWhatever it is you want you will find it in The Algarve.Personally I think it is as near to paradise as you can get on this earth.Remember whichever region you choose you can get from one end to the other in a couple of hours.Scenery is as spectacular and as changing as anywhere in the world,it is truly a wondrous place for photographers,amateur and proffesional alike. You want to to experience traditional Portuguese life.You will find it along the coast but just go a few short miles inland you will find it in abundance.From thriving towns to timeless and authentic little villages and generally the Portuguese are among the most hospitable people. east-west-algarveAccommadation?You name it you will find it.If you want high class hotels you will find the most in the central region.Budget hotels are in abundance and although cheap I have not yet found one that is not classy and comfortable with superb food.Hygeine standards tend to be very high in Portugal whether you stay in a luxurious hotel or a tiny guest house.Caravan and camping sites always seem to be cleanl and well run with all mod cons.Food everywhere tends to be superb.I think you can compare it to places like Devon.They can keep the best for themselves and the Portuguese pride themselves on being organic.You will find that most places do cater for the unadventurous eaters.So chips can generally be had if you ask.The Algarve has learned to cater for a great many nationalities and they tend to have a custom of trying to please everyone! As to expenses whilst on holiday,even with the low value of the pound as we speak you will find food and drink are very much cheaper than say the Uk.All activities tend to be more reasonable in price and bars and restaurants are in great abundance.You will find you can spend far less money here whilst having a good time.Finally lets look at the Algarves geographical situation.From the view of places to visit you will be hard pushed to beat the Algarve.You can pop into Spain without a passport with places like Seville being a comfortable day trip.Africa is a short ferry ride across the water.With Morocco being closest and well worth spending a couple of days.Two hours from the Algarve is the Portuguese capital of Lisbon and a little further is porto.Both well worth visiting.Nowadays many people fly to Lisbon spend a couple of days there and then take a very pretty train ride down to the Algarve.Makes a wonderfull holiday! With the economic climate of today we have found this year that very few British seem to be booking rental accommodation in the main summer period of July and August.Of course this is the most expensive time for summer holidays wherever you choose to go. So our apartments this year have been let to the Dutch and Spanish but we have found lots of British booking for September in Cabanas.It is much cheaper for them and the weather is usually just as good.Also there is still plenty of activity going on. So we will be very interested to see what happens next year,if this will become a regular pattern.I suspect it might. Prices have got a lot more expensive in Portugal due to so called European loans and forced austerity measures.Our area one can still do reasonably ok as there is a cheap supermarket just 3 minutes walk from our apartments and a very large cheap supermarket in the shopping mall in Tavira just ten minutes drive.Then there is anothe good supermarket even closer on the main road between Cabanas and Tavira. Many of the restaurants seem to still be quite reasonable with some tourist menus helping out.